I must apologize for the long delay since the last chapter of this story was posted. A computer crash and other problems interfered with my blogging schedule. All is well now, and we’re ready to go back to the Starborn Theatre and find out what’s happening with Starr, Starla, and the fictitious Ms. Starborn. When we were last at the theatre, Starr, Starla, and Ms. Starborn had followed Sir, one of the Theatre Cats, up the stairs to a vast attic room in pursuit of whoever stole the theatre’s costumes. When they arrived at the top of the stairs, the room was empty. Sir raced across the room and began pawing at the wall, seeming to try to get through it. When they followed him, they realized he was sliding his paw under a tiny gap at the bottom of the wall. Starla and Starr began to tap the wall above where Sir was scratching. Starr thudded one spot with the heel of his hand, and with a swish, a doorway opened in what had looked like a flat wall. “So it’s just sitting here, vacant?” Starla asked. Ms. Starborn hung back, but Starr and Starla followed Sir into the darkness. They soon thudded up against a flat surface. “There’s another door.” Starr thudded his hand against it in the way he had the corresponding door on the theatre side of the short passage. It opened onto a cavernous space that mirrored the one they had just left. “There’s no one here!” Starla said. Starla couldn’t keep her mind on the rehearsal. She missed several of her cues, and forgot a whole section of her monologue, which she’d had word-perfect at the last rehearsal. She went upstage when she was supposed to be downstage, and downstage when she was supposed to be up. She was standing upstage, trying to figure out how to make it look as though she was supposed to be there, when Ms. Starborn clapped her hands sharply to stop the play. “Sorry, Ms. Starborn.” Starla tried to concentrate, but for the first time in her life, she had no interest in what was happening onstage. “I’m with you.” They sneaked away, hoping no one would follow them. No one did – no one except Sir. He seemed as intent on solving the mystery as they did. This time the passageway wasn’t as dark as before. The door on the other side was partially open. Sir squeezed through the opening. Starr and Starla were about to follow him when the door slammed shut and they heard an unmistakable click-thunk as a deadbolt lock slammed into place. “They’ve locked it!” Starla exclaimed. “But Sir is in there! We have to rescue him!” Starla ran back into the theatre building and clattered down the stairs. Exits and Entrances: The meaning of these terms is fairly obvious. When a character in a play is to go onstage or offstage, the stage direction in the script indicates [Starla exits, stage right] or [Starr enters, stage left]. Cues: During a play, an actor relies on his or her memory to know when to speak or perform an action. They watch for signals that their turn is coming: a line of dialogue that is spoken just before theirs, a particular action done by someone else, or even the stage manager giving them a reminder, if they are offstage, waiting to go on. These signals, whether spoken or visual, are known as cues. If you miss your cue, you might either come in too early, and speak over someone’s dialogue, or leave someone waiting and wondering what to do when you don’t appear or you don’t say your line on time. Lighting, sound, and scenic cues are also important to the tech crew. 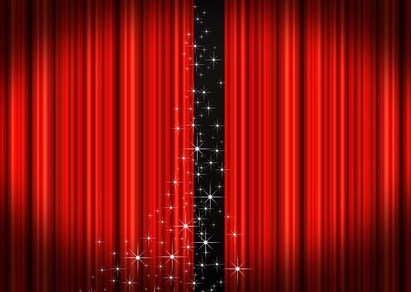 Upstage and downstage: Upstage refers to the part of the stage farthest from the audience. Downstage is the part of the stage closest to the audience. There was a time when stages were often “raked” – that is, the back of the stage was higher than the front, to make it easier for audiences to see. On such stages, upstage was literally UP, and downstage was literally DOWN. While modern stages might still be raked, the angle is not as steep as it was in the past. To “upstage” someone originally referred to an actor standing further upstage than he or she was supposed to, so that the other actors had to turn their backs on the audience to pay attention to him, and all the focus was turned on him. It has come to mean any way that an actor draws the audience’s attention away from the other actors.